Have you ever hosted preschool at your house? I am part of a co-op preschool that some friends and I put together and we meet once a week. Each mom takes a turn being host for 3-4 four weeks (while the other moms get a break) and then we swap. It is awesome. This week our theme was bugs! We explored a bug sensory bin, went on a bug hunt, and even made some play dough bugs. 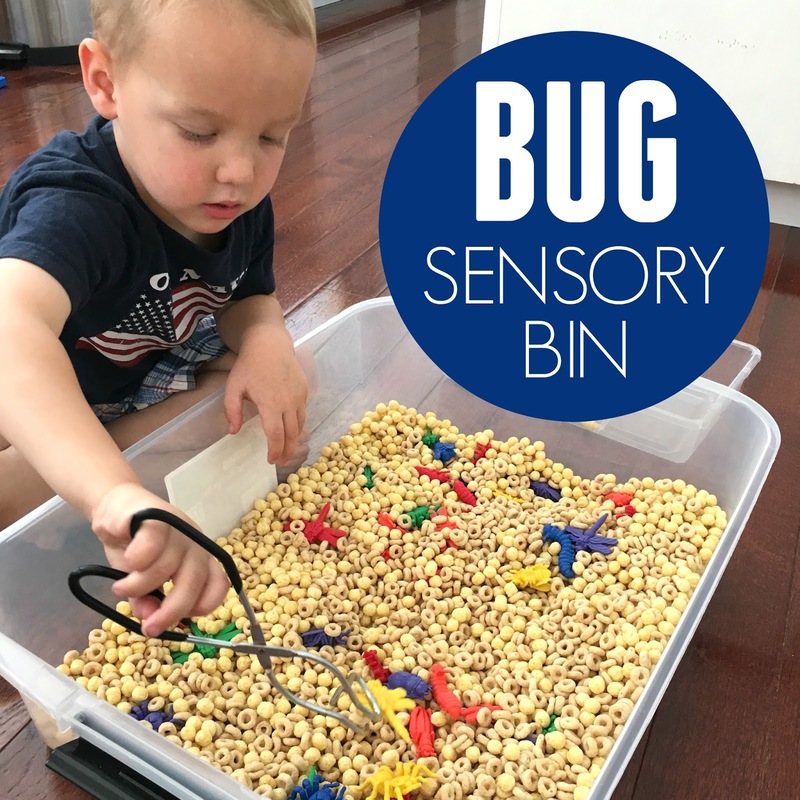 Sensory bins are a fun way to work on fine motor skills and explore things with our different senses. This colorful bug sensory bin was a hit! 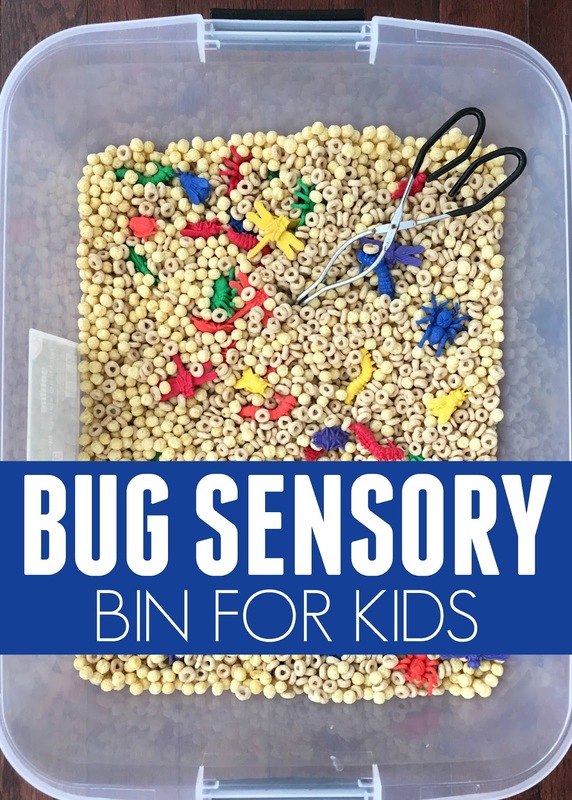 All you do is toss the bugs and cereal into a big bin and you are ready to explore!! We used our tongs to pick up the colorful bugs and put them in a smaller plastic tub. Kids sorted the bugs by color and just had fun playing with them too. Strengthening finger muscles and building fine motor skills are important as you prepare your child for writing. Kids also need strong finger muscles in order to do simple things like zip up their coat and button their buttons. Using tongs is a great way to work on fine motor skills and hand-eye coordination. My little preschoolers thought it was a fun challenge to try and use the tongs with only one hand. Kids that were not as strong would use both hands to help them use the tongs. Buying fun kid sized tongs can also be a great way to let kids working on fine motor skills. They can use them for all sorts of things! Transfer toys into their toy bins, picking up messes off the floor, or using them in simple sensory bins. For taste safe sensory bins that use edibles I like to use cereal that is stale. I collect stale cereal that winds up at the bottom of the bag and doesn't get eaten. 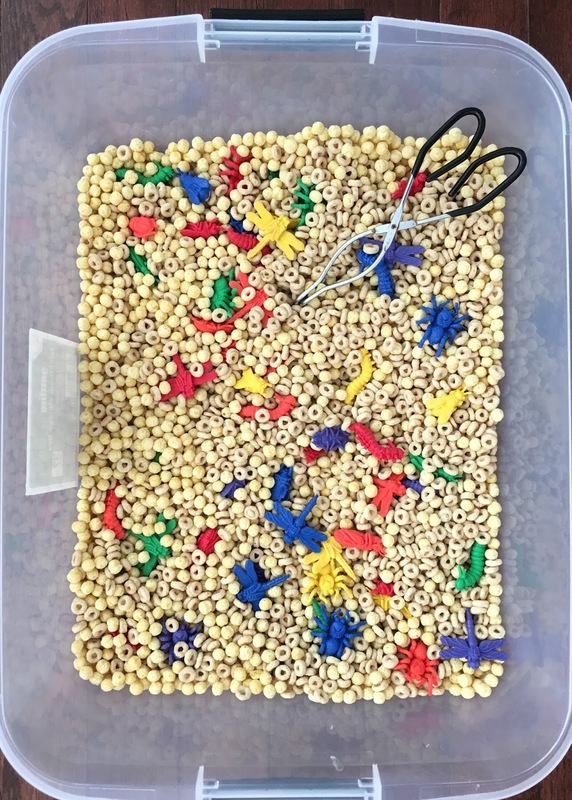 Usually I am planning to throw out and instead I combine it with other old cereal to make sensory bins. I don't typically go out and buy a brand new cereal box for sensory bins. Other sensory bin fillers I like include rice, beans, and water. Some people aren't big fans of using edible sensory bins for a whole range of reasons. That is totally fine. There are loads of sensory fillers that aren't edible. My favorites are sand and dirt! 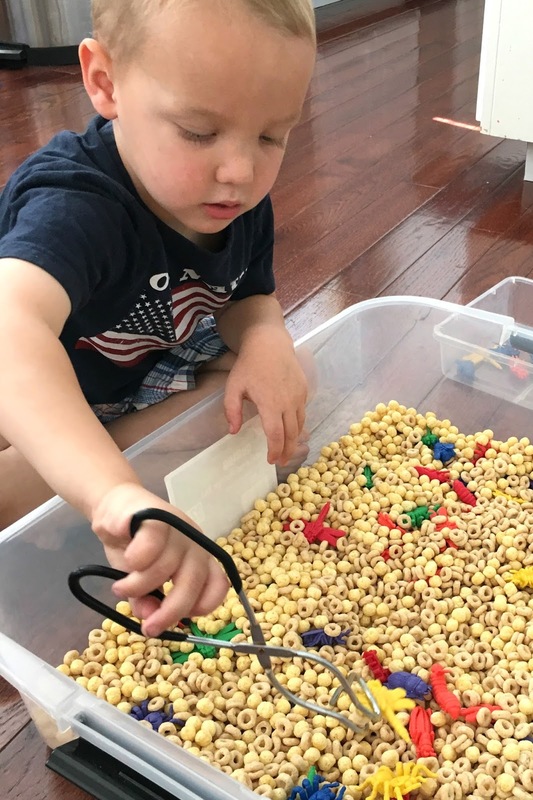 If you aren't sure if you want to use edible materials in your sensory bin check out this discussion on food use in preschool from Teach Preschool and this article on food use in preschool sensory activities by Tinkerlab. Both articles provide some good things to think about as you decide whether or not to use food in your preschool class for learning. Do you have any kids that like bugs? You can check out some of our other favorite bug themed activities HERE.